Sandeep Sharma was found guilty of article 2.1.5 of the IPL Code of Conduct for players. 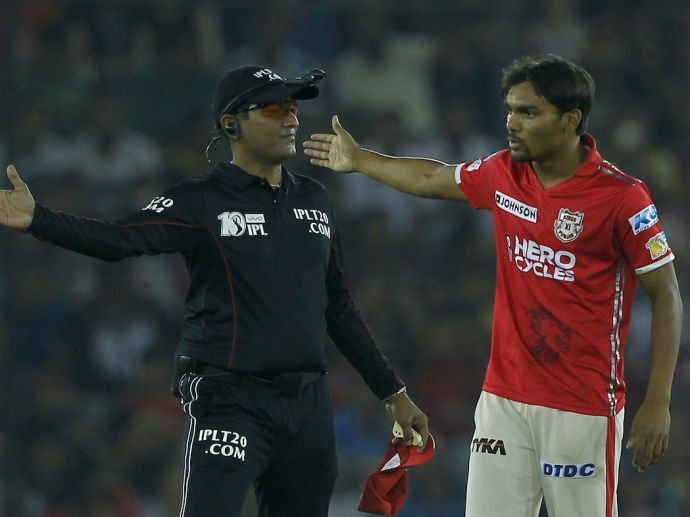 Kings XI Punjab pacer Sandeep Sharma has been fined 50% of his match fees for showing dissent at an umpire’s call during Punjab’s match against Gujarat Lions at IS Bindra stadium in Mohali on Sunday. The incident took place during the 5th over of the Gujarat Lions innings with Sandeep bowling his third over. When Sandeep decided to switch to round the wicket and Dwayne Smith, who was on the non-striker end, chose to stand wider of the crease, on-field umpire A Nand Kishore called his delivery a no-ball and proceeded to signal a free-hit as he believed that the bowler did not inform him of the side change. This led to a heated argument between Sandeep and Nand Kishore, with Punjab’s captain Glenn Maxwell also jumping in and showing signs of infuriation. Annoyed by his decision, the 23-year-old bowler snatched his cap from the umpire in visible anger at the end of the over. According to a statement from the organisers, Sharma admitted to Level 1 offence of the IPL Code of Conduct for Players and Team Officials and accepted the sanction. For Level 1 breaches of the IPL Code of Conduct, the umpire’s decision is final and binding. Sandeep Sharma is a leading wicket taker of Kings XI Punjab, picking up 16 wickets in this year’s IPL. In his previous match against Royal Challengers Bangalore, he was named the man of the match. Kings XI Punjab’s next match will be against Kolkata Knight Riders on 9th May.